And Frank. Frank may have been my favorite character, but it's hard to say since I enjoyed each one. He's now dead, but he's certainly not gone, and he hovers about the house, having the ability to move from place to place simply by thinking about it. Gert is really the one he was always meant to be with, but bad timing and perhaps the subtle thought that there was always time, kept him from making the right choice. 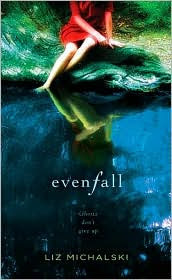 Regret can almost feel like its own character, and in Evenfall , the weight of its presence was felt through every page. Frank, though, is not ready to have it be part of him any more -- he's going to make it right, and sometimes he can project his presence to the point where Gert can feel him around her. It's not the time anymore for him to just sit back and let time slide by. I felt surrounded by so many things as I read this. Enveloped by the humid richness of the New England summer, the descriptions of farmland, peaches, and the setting sun so real I could see it before me. And reminder. Regret makes an incredible story, as Liz Michalski does with Evenfall , but it certainly does not make a good life. I was reminded to enjoy the moment, to see what was before me, and to not just pay attention to what, but most especially to whom. Liz Michalski has effortlessly crafted a story that resonates about love and life, and how strong longing can be in the afterlife. What's right is always right, and it doesn't matter when it happens, but making the effort to make it right is a lot better than living a lifetime of regret. This comes out in February - I envision book clubs really enjoying this one. And especially good for anyone on a rainy day. Visit Liz Michalski's blog by clicking here. Your review is fantastic! Isn't it wonderful when you find a book that you don't want to end? I have only had that feeling once this year but I so understand, you start reading slower and fully taking it in and so it last longer. What a marvelous review! I'll be waiting anxiously for this one to come out. That sounds great plus it's got a gorgeous cover! Sounds really good. I will definitely be looking out for this one. Terrific review by the way. I love it when I read a book that I wish would go on forever. Even if I feel bad when I get to the last page. Aleksandra -- I think you'll like it!! Let me know what you think when you read it! bermudaonion -- It was a treat to read a book like this, and I hope the next choices I pick up will be just as wonderful! Caitlin -- I know, the cover is just phenomenal! The colors are gorgeous and had such the artistic quality that worked so well with this story line and drew me to it! Yvette -- Thanks!! Do let me know what you think if you get a chance to read this one -- I truly didn't want it to end! Kelly -- Definitely put it on the wish list -- it's great! And keep an eye out on this blog -- I think that I'll be putting together a giveaway soon and I might include this as one of the choices to pick! This sounds charming. Thanks for introducing it to me! Lisa -- It is an incredibly charming story -- I'm glad I've put it on your radar! Oh wow, this does sound like a particularly evocative and wonderful book, and I have heard little about so far. I loved your review and really got caught up in your enthusiasm for the book and it's characters. I love it when I find books that I wish would never end, and it's definitely going on my wish list now. Thanks so much for the great review, Natalie! Ah, I love it when you start reading slowly just to make a book last a bit longer. Great review Natalie. I'll have to look for this one when it comes out. it's been a while since i've read a book like that! recently, i've been reading books that i can't wait to finish. lol. your review really is glowing and i'll look forward to the release of this novel. be sure to remind us of it in the new year. It sounds wonderful...and February much too far away! Something to look forward to. It sounds really awesome!! BTW, I was tagged, so I tag you! Wanting to read but not wanting a book to end becomes more of a savoring-every-word kind of experience. Lovely! This sounds so good - you put together a wonderful review here! Wow, it is definitely awesome to find a book you don't want to end..love your review. Will look out for this one here. you make this sound so good! such a fun review to read. i must say i'm pretty excited to be moving back to the states and have easy access to whatever book i want! What a gorgeous cover! and the book seems to live up to the lovely cover too! Thanks for the review! So excited to put this on everyone's radar! I think this is going to be a very popular book next year! !